Raft spiders (Dolomedes species) are one of the largest spiders in the United Kingdom. Like other spiders they hunt by running on the surface of water, and can submerge altogether to hide from predators. There are two species found in Britain, the Raft Spider Dolomedes fimbriatus which is semi-aquatic and lives around acidic bogs and on heathland, especially where there are small pools of water. Juveniles are often found some distance from water and above the ground on scrub. The closely related Fen Raft Spider (Dolomedes plantarius) is similar in size, habits and appearance, but lives in fens or coastal grazing marsh ditch systems. It is extremely rare, recorded only from three areas in the country, and is protected under Schedule 5 of the Wildlife and Countryside Act 1981. Please describe the habitat in which you found your spider when you submit your record. 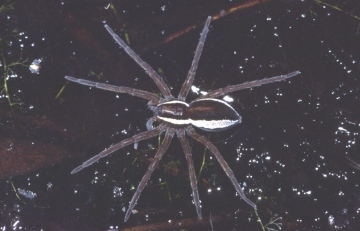 Adult raft spiders are large, the body measuring up to 22 millimetres (0.87 in) long with a leg span of about 70 mm (2.8 in); as with most spiders the male is considerably smaller. They are dark chocolate brown in color (or greenish in juveniles) with a conspicuous white or cream stripe along each side. Raft spiders can be confused with Pirata wolf spiders, which also run on water and have a similar pattern, but are much smaller. 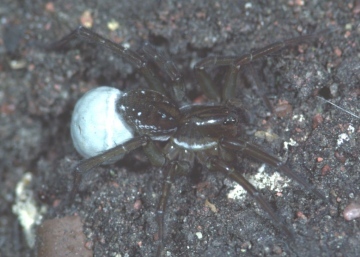 One example, of a female Pirata piraticus carrying its eggsac, is shown.